This is the third of a 3-part series covering these topics in more detail. With investing and life, we believe you should focus on things that matter and things that you can control. That is the basis for each of the three pillars of our investment philosophy. We recognize we cannot control or predict the direction of the stock market even though we are all bombarded constantly with breaking news and prognostications. We choose instead to rely on evidence-based investing from years of history and academic research. This is knowing that the structure of your portfolio and the amount of risk you take is directly correlated to the amount of return you achieve over time. Taking on risk requires watching your portfolio values fluctuate. Having the proper expectations can go a long way in keeping your emotions in check and staying the course. Over the long-term, we believe that is the wise approach to investing. 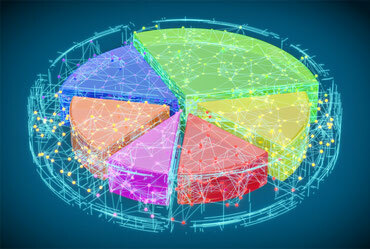 We believe it is important to use low-cost mutual funds or exchange-traded funds (ETFs) to accomplish diversification. Studies have shown that excessive costs of underlying investments may have a negative impact on overall investment returns. To illustrate, we have included a chart below of The Mutual Fund Landscape study conducted in 2017 by Dimensional Fund Advisors LP. 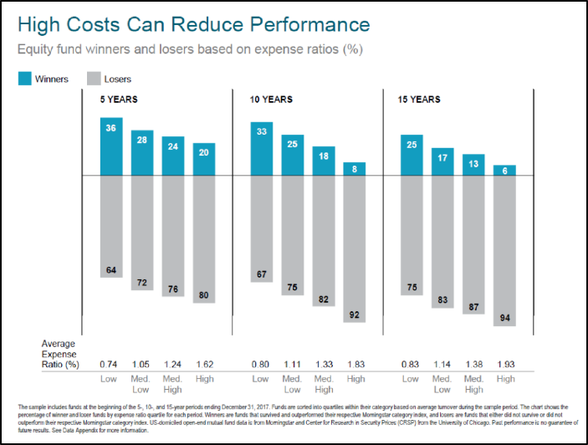 In each of the time periods (5, 10, and 15 years), the lower the expense ratio in the funds the more winners or outperforming funds vs. their benchmarks. For more information on investments and underlying cost, check out our blog post The Cost of Advice and Investments. Taxes matter when it comes to investing. While not the most important element in investing, we believe prioritizing tax efficiency is a part of optimizing your entire portfolio. Tax efficiency can be the types of investments used such as mutual funds, tax-advantaged mutual funds, or ETFs. Another important factor is the location of your investments. For example, bonds or income-producing investments can be placed in your IRA to shelter the continuous income from your tax return each year until you pull money out of your IRA in retirement. This asset location strategy would likely require you to have a more conservative allocation in your IRA and more aggressive allocation in your taxable account to achieve your desired overall asset allocation. When it comes to retirement savings, knowing where to put your money to obtain the most tax benefit depends on your specific situation. You may benefit more from contributing to a Roth IRA instead of a Traditional IRA. You may want to contribute to a 529 Plan for your child’s education savings. All these accounts have tax advantages either today or in the future. While it may be harder to keep up with the benefit from tax-efficient decisions, we believe they can have a material impact over the long-term. In a 2016 Vanguard study on advisor value, research found that strategic asset location could add as much as 0.75% annually to an investor’s overall portfolio. Additionally, a spending strategy organizing the order of an investor’s withdrawals from different account types in retirement could add as much as 1.10%. Both of these value-added financial planning strategies are directly associated with tax efficiency. If you would like more information on our investment philosophy, click here to receive a copy of the book – The Investment Answer. This book addresses the five key decisions that every investor must make. It gives greater detail and insight into our philosophy. At the heart of investing wisely is having a solid long-term plan. By doing this, you will have the proper expectations of your risk and return to withstand the things that are outside of your control (market volatility, new tax laws, etc.). The same is true in life. If you focus on what matters (faith, family, health, purpose) and things you can control (expectations, attitude, daily habits), then you are positioned to best handle the ups and downs of life. Our desire at Eaglestrong is to bring clarity to your priorities to connect them with your financial decisions. 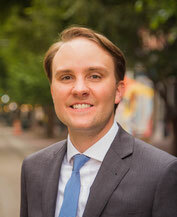 Tripp's passion for financial planning is evident to each and every client he meets with. His desire is to help his clients organize finances, reduce taxes, and invest wisely. Tripp strives to work in a humble and transparent way. - The Mutual Fund Landscape study (2018) is conducted by Dimensional Fund Advisors LP. US-domiciled open-end mutual fund data is from Morningstar and Center for Research in Security Prices (CRSP) from the University of Chicago. The sample includes funds at the beginning of the 5-, 10-, and 15-year periods ending December 31, 2017. - Francis M. Kinniry Jr., CFA, Colleen M. Jaconetti, CPA, CFP®, Michael A. DiJoseph, CFA, Yan Zilbering, and Donald G. Bennyhoff, CFA (2016, September). Putting a value on your value: Quantifying Vanguard Advisor’s Alpha®. Vanguard Research. - Goldie, CFA, CFP®, Daniel C. & Murray, Gordon S. (2011). The Investment Answer. New York, NY: Grand Central Publishing.